Refer to LU-10, "Removal and Installation"
Remove engine under cover. 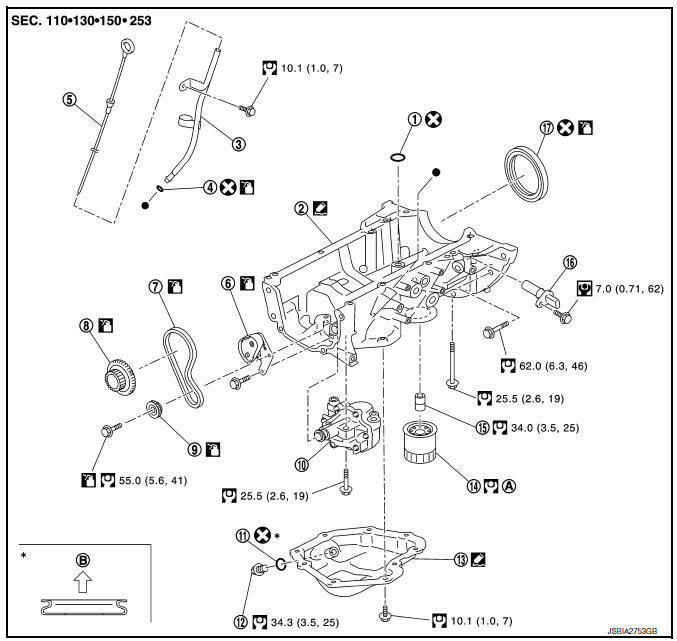 Refer to EXT-16, "Exploded View". Remove air cleaner and air duct. Refer toEM-25, "Removal and Installation". Remove fender protector. Refer to EXT-28, "FENDER PROTECTOR : Removal and Installation - Front Fender Protector". Remove timing chain. Refer to EM-49, "Removal and Installation". Do not reuse O-rings or washers. Tighten bolts in numerical order as shown. Check the engine oil level. Refer to LU-7, "Inspection". Start the engine, and check that there are no leaks of engine oil. Stop the engine and wait for 10 minutes. Check the engine oil level, and adjust the level. Refer to LU-7, "Inspection".